Note: this page contains thumbnail images. Clicking the thumbnail will open a larger image. Not for the first time this week, we caught the 08.24 train from Ringgenberg on the SBB Brnig line to Interlaken Ost, followed by the 08.39 ICE to Spiez. We met our guide for the day, Hanspeter Hunkeler of the BLS Lötschbergbahn AG on the platform at Spiez. Our first visit of the day was to Spiez Signalling Centre, which is a relatively new installation being completed in the mid 1990's. 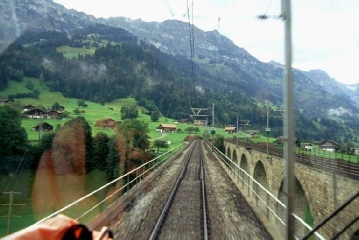 Spiez controls approximately 30km of route: to Interlaken, as far as Thun on the line towards Bern and as far as Frutigen on the Brig route. 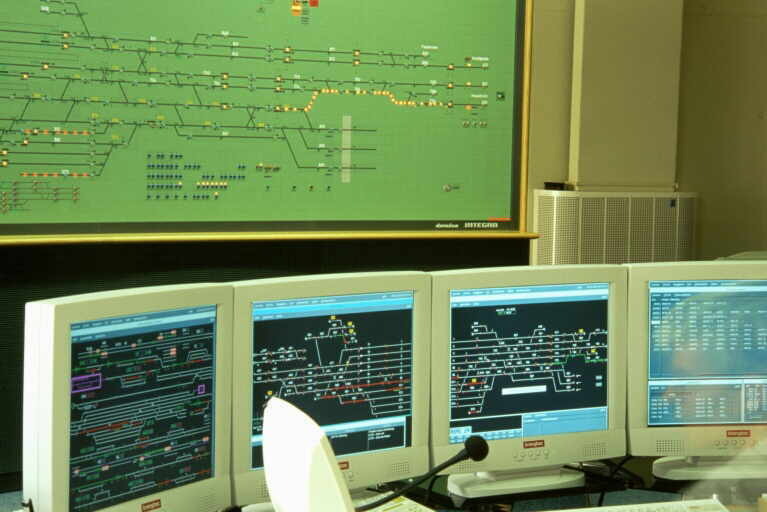 The signalling centre is owned and operated by BLS. Despite being recent, all interlocking is by relay-based technology. 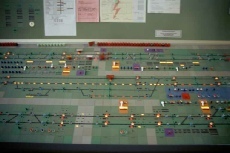 Dominating the operating floor is a tiled mimic panel in pea green and rather familiar in appearance to panels installed in most UK signalling centres. The panel shows the track in the Spiez station area and a couple of kilometres in each direction. Conventional route entry and exit buttons are included on the mimic diagram, but only used in emergency following equipment failure. Routes can also be closed for maintenance possession by pressing buttons on the mimic. 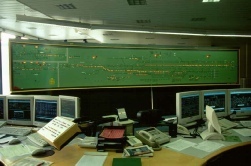 Three workstations are located in front of the mimic, each with six monitors - three of which display track diagrams of the route being controlled. 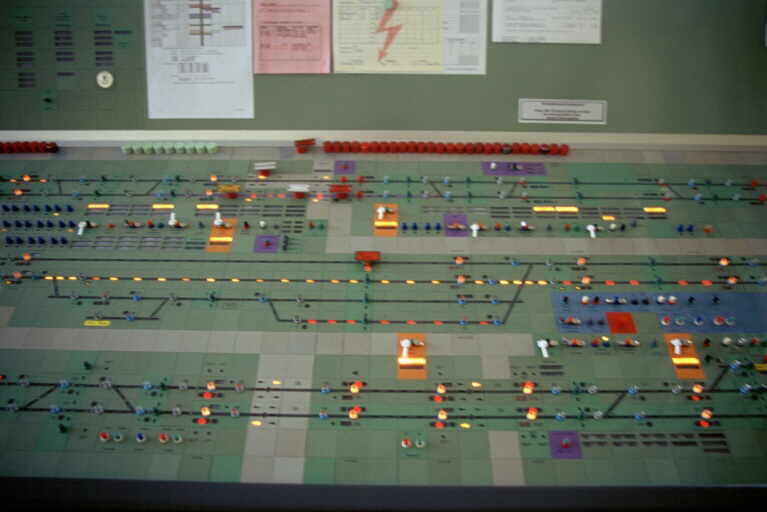 One more workstation, set back from the rest, handles despatch control and train service regulation. Routes are set by mouse click. 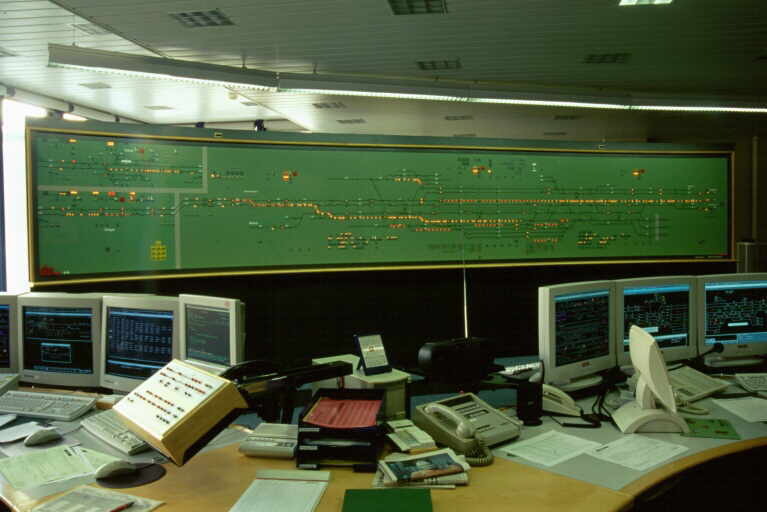 Automatic train control and automatic route setting are both employed, which in normal operation automatically set routes after reference to the train reporting number and the timetable - significantly reducing the signalmens’ workload. One screen consists of a telephone concentrator and combines signal telephone and cab-to-shore radio on the same display. Signal post telephones are installed at every signal except those in station areas. Like in the UK, all radio and telephone conversations are recorded. 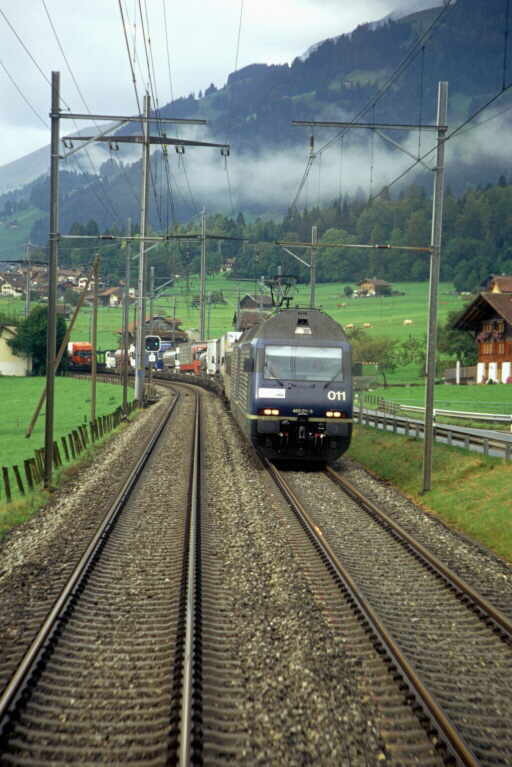 Two train radio systems are in use: a BLS and a SBB/CFF/FFS (Swiss Federal Railways) system. The radio systems do not support secure communications (secure - meaning that a radio channel is dedicated between signalman and train driver and cannot be heard by anyone else), but does display the locomotive/unit number of the train being communicated with. 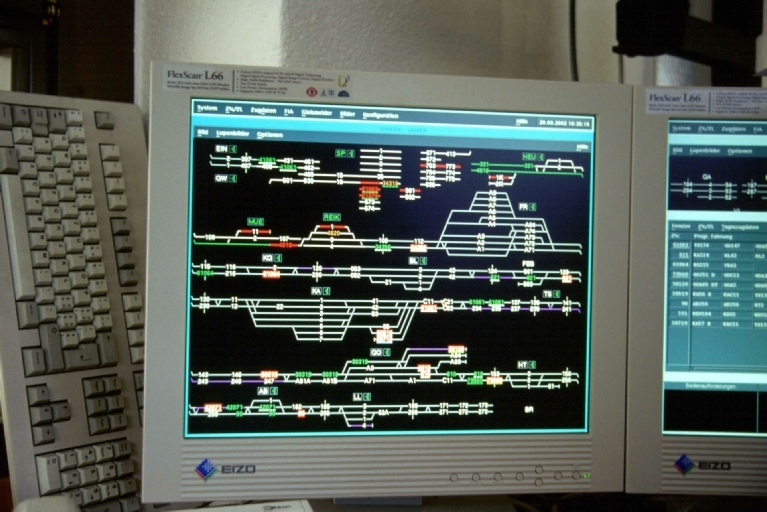 Of the remaining screens, one is a 'windows' PC system used to display train-running information (equivalent to 'TRUST' information in the UK) and can also be used for interrogation of other central systems. The remaining screen is used for control of the normally-automatic customer information system in the area being controlled by the signalman. Station help point calls are also displayed on this screen and a microphone is available for the signalman to respond to help point enquires. However, this system sees very little use by passengers, which is perhaps testimony to a railway network on which the trains normally run to time! Finally, a small temporary NX (entry/exit) panel is installed on the operating floor to operate the Krattighalde interlocking area, which had been damaged by rock fall. After leaving the signalling centre we were then fortunate to be given the opportunity to travel in the cab of SBB Class Re460 locomotive, 460-022 from Spiez to Kandersteg, on the 10.53 from Spiez. 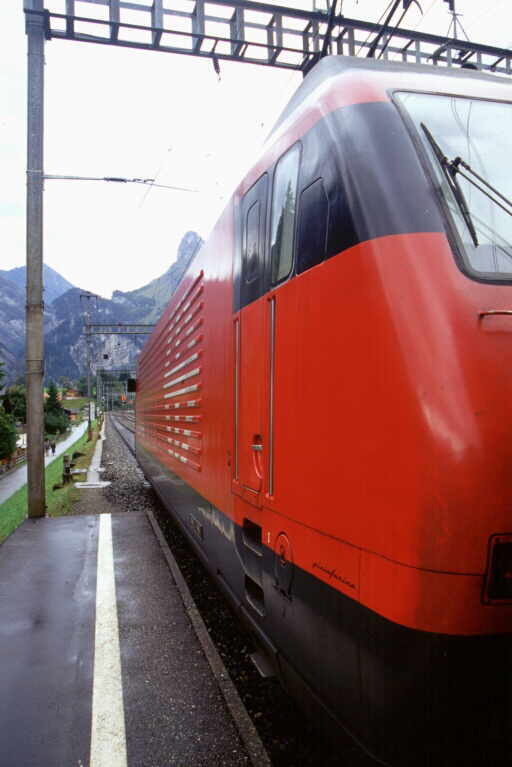 This train was the 07.41, IC814 from Romanshorn to Brig, formed of some twelve coaches weighing, according to the driver's manifest, 525 tonnes. The 118 Class Re460 locomotives were built by ABB and were introduced between 1991 and 1996 for InterCity, InterRegional and some freight traffic and have a total power output of 6,100kW (approximately 8,180hp), with a maximum speed of 230km/h (about 143mph). Four three-phase asynchronous motors provide traction. No sooner had we climbed into the cab and got into comfortable positions than the signal in front of us indicated we had the right of way and we rapidly moved off. Immediately obvious was the excellent driver visibility form the large single-piece cab window; larger than that on a British HST. There are also smaller side windows at each side of the cab, at drivers’ eye height. 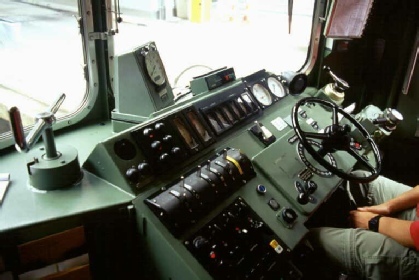 Additionally, power-operated mirrors are fitted each side of the cab and the appropriate mirror is utilised by the driver at each station stop and when pulling away from a station, giving a view of the platform and the train behind. These pop out form special apertures in the side of the cab, are controlled by the driver by foot-operated buttons and are viewed from the cab through a glass panel in the mirror recess. Blinds are fitted to cover all the windows and it was noticeable that unused locomotive cabs, such as on the rear of our locomotive, were usually observed with all the blinds down, presumably to avoid the cab heating up too much in the sun. Power controller on driver's right, configured as follows: central position - coast; push away for power and towards the driver for electric locomotive brake. The electric locomotive brake normally regenerates back into the overhead wires, but can switch to rheostatic mode, using resistors on the locomotive, if the overhead wire supply is not receptive. On the driver's left are two similar controls for train and locomotive air brakes - more on the use of these later. Immediately in front of the driver is a large analogue speedometer, with a red pointer indicator at the adjustable speed-set point. Automatically, using a combination of power and electric brake, once a pre-set speed is reached the locomotive automatically stays at that speed. To the left of the speedo are two analogue brake gauges for locomotive, train and main reservoir brake pressures and to the right, a locomotive ammeter and line voltage meter. A cab-to-shore radio panel is on the left hand side, which during our trip was displaying the maximum permitted speed of the train and weight. 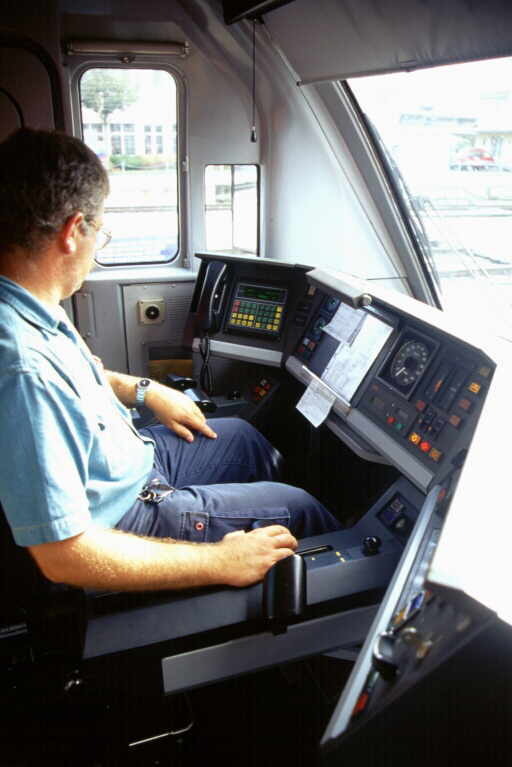 On the right is a locomotive diagnostics and management system panel. This was used whilst we were in the cab and showed, amongst other things, wheel slip and individual traction motor power and temperature (the leading motors being shown to be cooler than those on at the rear of the locomotive) - power is automatically adjusted between the motors to achieve optimum adhesion. A vigilance system is fitted which, if the controls have not been moved for a period of time, give a 'beep-beep' tone which must be acknowledged by the driver to prevent the brakes being automatically applied. A system, not unlike British AWS, is also installed with the driver must acknowledging warnings of any adverse signal aspects by using a button, which is then illuminated until a 'clear' aspect is reached. Unlike in Britain, there was no sound given for clear signal aspects. 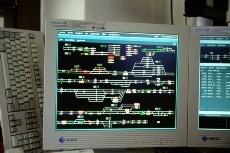 Like in the UK, the left-hand track is normally used and line-side signals are on also on the left. Leaving Spiez, despite the train weight and the gradient, we rapidly gained speed. After leaving the first tunnel, the driver made much use of a manual sanding button to lay sand in order to regain maximum adhesion; wheel slip being simultaneously indicated on the diagnostics display. I was standing up in the rear of the cab behind the driver and it suddenly dawned on me that it was the first time I had ever stood on a locomotive footplate without having to hold onto anything; I was standing without support due to a combination of superb Swiss P.Way and excellent locomotive ride. Noise levels were also low, the main noise being some traction motor whine from directly below. 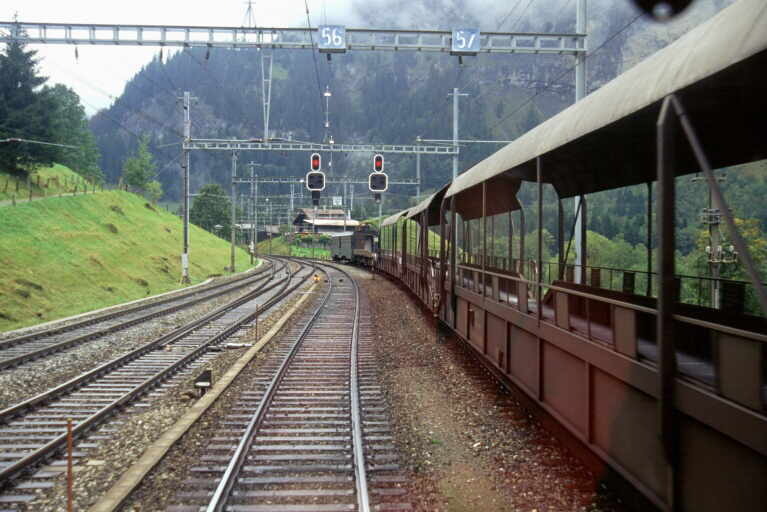 Approaching the first station, Frutigen, the driver reduced speed using the combined power / electric brake controller, including use of the 'maximum' electric brake position and as speed fell, simultaneously used the train air-brake controller on his other side. Just before we stopped there was a distinct jolt as the regenerative brake cutout due to lack of effect at low speed. Once stopped and mirror used, the train doors were released by the driver pressing a button on the dashboard. It is standard practice in Switzerland for the driver to release train doors, but for the train guard to close them. Whilst standing at Frutigen, a message was broadcast on the cab-to-shore radio that there was engineering work ahead; we were to be partly working wrong-line and locomotive power was to be reduced due to traction supply works. 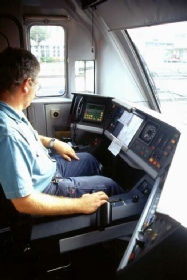 Traditionally traction power would have been reduced by the driver using lower control handle positions, therefore reducing speed and acceleration, but on the Class 460 a button was simply pressed on the dashboard to instruct the locomotive to use only 50% power. Departing, it was noticeable that on 50% power, acceleration was reduced and with the heavy load and gradients, maximum line speed was not quite achieved. For some of the journey to our next station we were routed 'wrong road' on the right hand track due to engineering work on the other line. Like most Swiss lines, both lines were bi-directionally signalled. An 'AWS' type warning was given of the reduced line speed in the engineering works zone - a system similar to temporary AWS magnets being used. We left the locomotive at the next station stop, Kandersteg. The 14.6km Lötschberg Tunnel provides a route through the Alps massif from Switzerland and Northern Europe through to Italy. Work commenced on building the tunnel in 1906 and was complete by 1911. 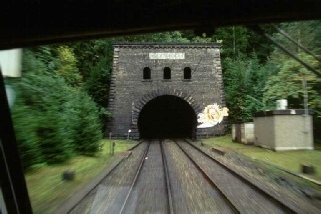 Initially the tunnel was used for just rail traffic, but in 1950 BLS conveyed 225 road vehicles through the Lötschberg Tunnel on special rail transporter wagons. Car terminals were set-up at Kandersteg at the Northern end of the tunnel and Goppenstein at the South. Initially car transport was sporadic; however with the emergence of individual motoring in the early 1960s, it soon proved to be an essential facility: In 1960 13,718 vehicles were transported through the Lötschberg Tunnel; 10 years later the figure had already risen to 227,070, and by 1980 to around 750,000; since 1990, more than 1.2 million vehicles are conveyed this way each year. By the end of 2001 a total of 27.5 million vehicles had been transported. At the end of 1993 BLS was commissioned by the Confederation to provide a piggyback corridor for trucks with a maximum width of 2.5m and a height of 4m on the line through the Lötschberg Tunnel, pending the commissioning of the base tunnel. 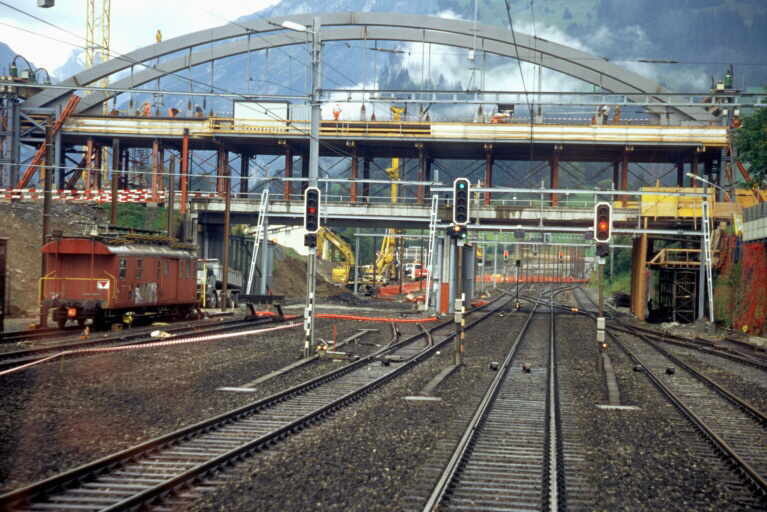 Construction work to modify the tunnel began in January 1994. 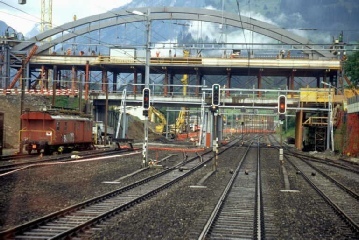 Opening was delayed due to geological problems on the southern side of the Simplon, but operations finally began on 11 June 2001. Special truck transporters with small wheels are used to keep within the loading gauge. We were then taken across the car terminal marshalling area and into the car shuttle train crew mess room. This was the best railway mess room I had ever come across, consisting of an almost new self-contained varnished wooden building with steep pitch roof in typical Swiss-chalet style. We were introduced to our driver, who was one of 32 drivers that BLS had recruited from Germany after being unable to obtain enough drivers from within Switzerland. In the holiday season car shuttles depart every 15 minutes on Saturdays and Sundays and every twenty minutes on other days between about seven in the morning and seven in the evening. A thirty-minute frequency is maintained at other times from around five in the morning until around midnight. 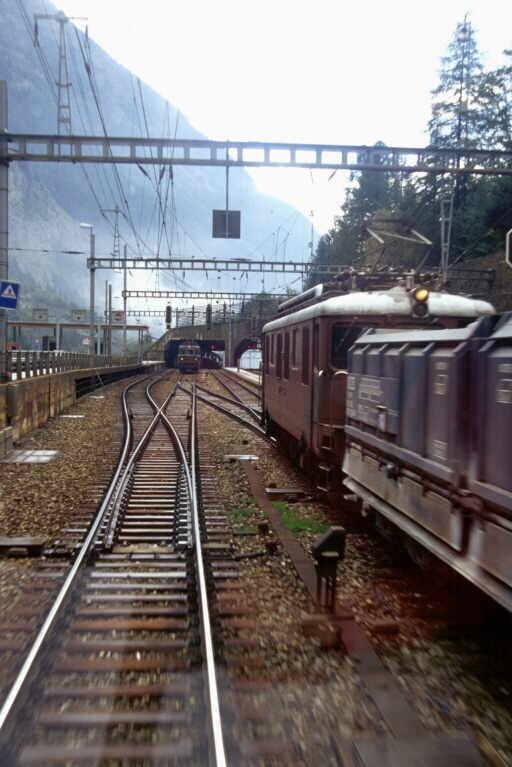 Each shuttle consists of a driving trailer vehicle at the Goppenstein end; a number of open, but roofed, transporter wagons and finally a Class Re4/4 locomotive at the southern end. The driving trailers are either EMU conversions or have been purpose-built and contain, as well as the driver’s cab, space for cycles/motorbikes and seats in a saloon for their riders. We were to ride on train number 30121, booked to take 18 minutes for the journey and propelled by Re4/4 locomotive 179 "Bern", which was built in 1972 and fitted with Brown Boveri electrical equipment. As we were travelling towards Goppenstein we had to first walk down the train to the driving trailer through the empty car transporter wagons, which was an experience in itself. On the Re 4/4 locomotives the electric brake works in one of two modes: regenerative, where current is returned to the overhead traction supply when it is 'receptive', i.e. another train is in the area drawing power, or rheostatic, where the energy is dissipated as heat through resistance banks on the ocomotive when the overhead is not receptive. The driving trailer was one of the purpose made coaches, but the cab was similar to EMUs of the same generation. Dominating the driver's desk is a central wheel, which is moved clockwise to apply power. A lever next to the wheel initialises the electric (locomotive) brake, which is progressively applied by moving the wheel anti-clockwise. A conventional train air brake lever is located to the left of the wheel. 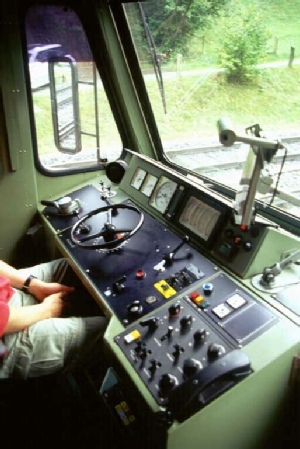 Dials behind the wheel and below the cab window display: train speed; line voltage; total power output; maximum difference in current being drawn between the locomotive's traction motors; main brake reservoir pressure and train brake pressure. A cab-to-shore radio and train-telephone handset is also fitted. Unfortunately I was unable to take many notes whilst riding through the tunnel, as it was not possible to write in the dark! However, after around quarter of an hour in the tunnel, we emerged into the open and almost immediately entered the Goppenstein terminal, gently kissing the buffer stops as we came to a stand - obviously some regulations in Switzerland differ from those in the UK! We then walked around the terminal approach road, part of which was on a spectacular viaduct over a valley and rejoined the train at the locomotive end for the trip back. The locomotive cab was essentially very similar to the driving trailer, but with more switches and a prominent handbrake 'wheel'. The main reservoir and train brake gauges were combined into two dials on the same instrument on the locomotive. It was noticeable that the locomotive was rougher riding than the driving trailer, though still quite respectable. As trains passed each other in the tunnel, the drivers greeted each other by momentarily switching on their cab lights. As I was rather enjoying the experience, all too soon we arrived back at Kandersteg and after saying farewell to our driver and having a very good value lunch in the station restaurant with our host, Hanspeter Hunkeler, we then had the rest of the afternoon free. I chose to have a quick wonder around the picturesque village of Kandersteg, noticing that in this almost crime-free part of Switzerland even the partly-filled church collection box was unlocked, before rejoining the rest of the L&CI members on a bus to the exhibition centre about the new Lötschberg AlpTransit Base Tunnel. After which I caught the chair lift up to Oeschinen, had my first go on a toboggan, which was rather fun, before walking to the picturesque lake of Oeschinensee and then back down the mountain to the village for trains back to Ringgenberg. Lecture on BLS Lötschbergbahn AG by the Institution's vice president Willi Frauenfelder.